Raaga.com: Why did actor Pran turned down his Filmfare award? Why did actor Pran turned down his Filmfare award? Naushad, Shankar-Jaikishen, Laxmikant Pyarelal ,R.D.Burman, A.R.Rehman are the few names that immediately popup as one mentions about Hindi film music. Though, it’s true that these legends have a lion’s share in grooming the Hindi film music, yet, there are many who, despite their elephantine contribution didn’t really received the kind of accolades that these maestros derived, particularly in the arena of awards and recognition. To cite an example of one such ‘ignored’ musical wizard is ‘Ghulam Mohammed’, the exceptionally brilliant music director who has the ‘lone’ distinction of setting to tune Ghalibs complicated ghazals in the most commercially successful form in Sohrab Modi’s ‘MIRZA GHALIB’. In fact, in the even Jagjit Sing’s superlative score in Gulzar’s T.V. serial Mirza Ghalib too, falls short, in terms of the mass popularity which Ghulam Mohammed’s music possessed in ‘Mirza Ghalib’. The songs were such a craze that forgets the intellectual even the illiterate hummed on streets!!! The movie solely on the strength of its extraordinary music not just broke box – office records but also fetched its maker the prestigious ‘Best film’ national award, but alas! The man who injected life was left neglected!!! Even the popular – Filmfare Award gave him a Nelson eye! But the maestro didn’t complaint. Though, genius don’t complain, rights thinking people, do protest. And that’s exactly what happened when for the second time ‘Ghulam Mohammed’ was out played in the award games, when his master piece creations in Meena Kumari ‘s PAKEEZAH lost to the lesser known creation of music director ‘Shankar-Jaikishen’ in the movie BE-IMAAN during the Filmfare Awards of 1972. 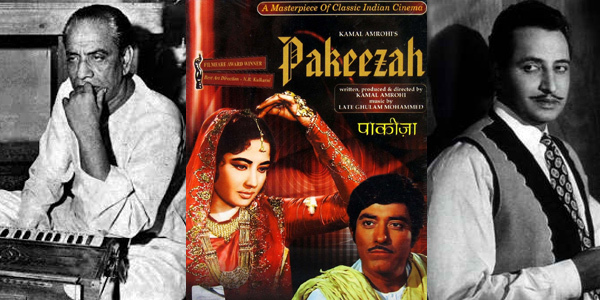 Readers would agree that music of PAKEEZA, was the backbone of the movie. Angered upon by the juries ‘indifferent’ decisions in the music categories, actor Pran in a ‘loud’ protest declined to accept his Filmare trophy awarded to him for ‘Best Supporting Actor’ in the movie BE-IMAAN. More than the award, it must be Pran’s touching gesture that must have made the maestro Ghulam Mohammed proud! And why not? Because it is the people’s award that is ultimate, while rest all awards are pigmies in front of them!! !